NioCorp and IBC Announce Successful Completion of Initial Casting Campaign for Aluminum-Scandium Alloys - NioCorp Developments Ltd.
Wilmington, MA (December 28, 2017) — NioCorp Developments Ltd. (TSX: NB, OTCQX: NIOBF, FSE: BR3) (“NioCorp”) and IBC Advanced Alloys (TSX-V: IB; OTCQB: IAALF) (“IBC”) (collectively the “Companies”) today announced the successful manufacture of several aluminum-scandium alloy ingots. These test pours occurred at IBC’s Wilmington, Massachusetts Engineered Materials facility using scandium purchased commercially by NioCorp. 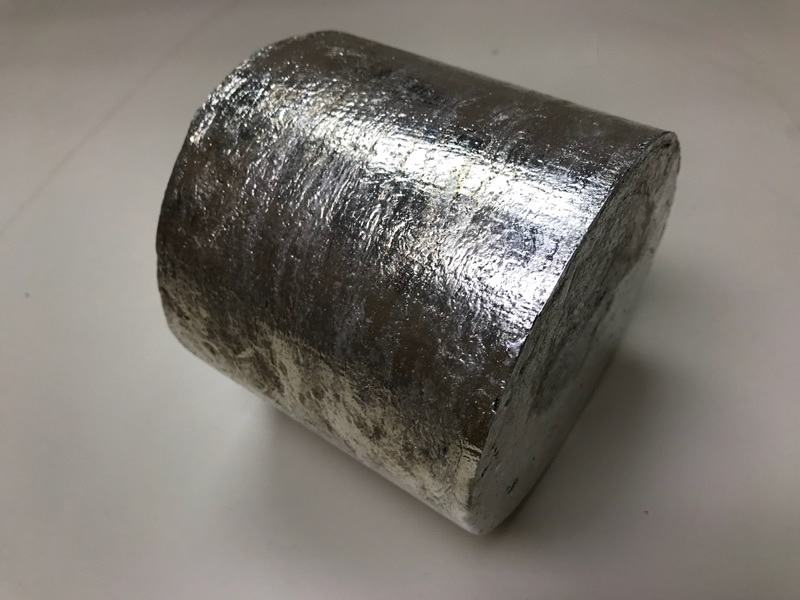 The ingots, representing a range of scandium content, will now undergo chemical analysis and other metallurgical testing to confirm the microstructure and performance of the alloys. This testing is the basis for commercializing Aluminum-Scandium alloys. Alloys that incorporate scandium have been produced for more than 50 years for a wide variety of applications in the defense and civilian sectors. When combined with aluminum and other metals, for example, scandium helps to make a very strong and lightweight alloy material that can deliver significant performance enhancements, weight savings, fuel efficiency, and air emissions reductions in transportation systems. The former Soviet Union reportedly used scandium-bearing alloys in high-performance jet fighters and in other military aerospace systems. Mr. Huskamp, who leads IBC’s team of metallurgists and alloy production specialists, is President of IBC’s Engineered Materials Division, which currently manufactures high-performance beryllium-aluminum alloy parts for a number of systems in both the defense and civilian sectors. Mr. Huskamp is a former Boeing Associate Technical Fellow in advanced metallic processes, and is credited as a named co-inventor of two patents regarding scandium-bearing aluminum alloys. NioCorp is currently developing the Elk Creek Superalloy Materials Project, an advanced materials processing facility planned for southeast Nebraska that expects to produce just over 100 tonnes per year of scandium trioxide, as well as niobium and titanium products. Such large-scale production of scandium in Nebraska would establish the United States as a global superpower of scandium. IBC is a leading beryllium and copper advanced alloys company serving a variety of industries such as defense, aerospace, automotive, telecommunications, precision manufacturing, and others. IBC’s Copper Alloys Division manufactures and distributes a variety of copper alloys as castings and forgings, including beryllium copper, chrome copper, and aluminum bronze. IBC’s Engineered Materials Division makes the Beralcast® family of alloys, which can be precision cast and are used in an increasing number of defense, aerospace, and other systems, including the F-35 Joint Strike Fighter. IBC’s has production facilities in Indiana, Massachusetts, Pennsylvania, and Missouri. The Company’s common shares are traded on the TSX Venture Exchange under the symbol “IB” and the OTCQB under the symbol “IAALF”. The TSX Venture Exchange has not reviewed and does not accept responsibility for the adequacy of this news release. Neither TSX Venture Exchange nor its Regulation Services Provider (as that term is defined in the policies of the TSX Venture Exchange) accepts responsibility for the adequacy or accuracy of this release. This disclosure contains certain forward-looking statements that involve substantial known and unknown risks and uncertainties, certain of which are beyond the Company’s control including: the impact of general economic conditions in the areas in which the Company or its customers operate, including the semiconductor manufacturing and oil and gas industries, changes in laws and regulations including the adoption of new environmental laws and regulations and changes in how they are interpreted and enforced, increased competition, the lack of availability of qualified personnel or management, limited availability of raw materials, fluctuations in commodity prices, foreign exchange or interest rates, stock market volatility and obtaining required approvals of regulatory authorities. In addition, there are risks and uncertainties associated with manufacturing activities therefore the Company’s future results, performance or achievements could differ materially from those expressed in these forward-looking statements. All statements included in this press release that address activities, events or developments that the Company expects, believes or anticipates will or may occur in the future are forward-looking statements. These statements are based on assumptions made by the Company based on its experience, perception of historical trends, current conditions, expected future developments and other factors it believes are appropriate in the circumstances.